Well, I suppose I would be remiss if I did not post a chocolate recipe in honor of Valentine’s Day. So, I am going to share what I will be serving to all of my love bugs on this day of romance. I posted a version of this recipe a long time ago but it is one of those things that my children ask for again, and again, and…again. And thank goodness for me…it involves chocolate. 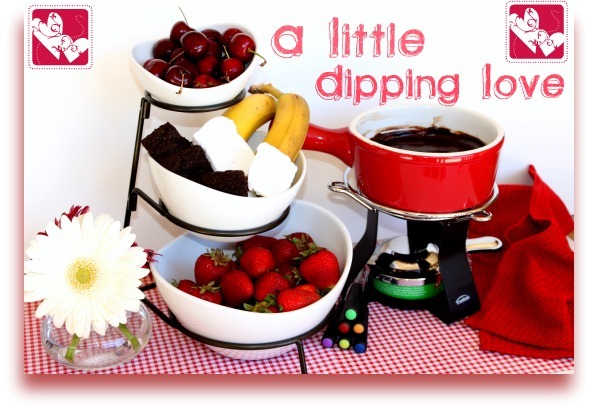 This in-demand Allergy-free Valentine’s Day dessert I am talking about is, of course, Gluten-free Dairy-free Chocolate Fondue (also easily made to be Nut-free as well)! But do not thank me for this recipe posting. Thank my boys who reminded me of it as we were driving back from our family ski vacation yesterday. I was quizzing them about what I should share with you all for an Allergy-free Valentine’s Day Dessert. This was what they came up with. It was their choice. So, I declared them brilliant and called it a day. I hope you enjoy it as much as they will. Fruits: apples, pears, peaches, pineapples, citrus sections, strawberries, cherries, raspberries, blackberries, sliced bananas (can even grill or caramelize them first), dried apples, dried mangoes, or any other dried fruit. Cakes and Other Treats (all allergy-friendly versions, of course): graham crackers, brownie pieces, marshmallows, cookies, shortbread, biscotti, crystallized ginger chunks, bacon (yup, I said it). There is no wrong answer for what to dip. Use your imagination. Have fun. Go wild. Well, not too wild. This is, after all, a family-friendly blog. 1. Warm the Mimic Creme (or Full-Fat Coconut Milk or Heavy Cream) in a heavy bottomed pan until small bubbles begin to form and it comes to a very light boil. Then add the chocolate pieces and gently whisk until melted, smooth, and fully incorporated. 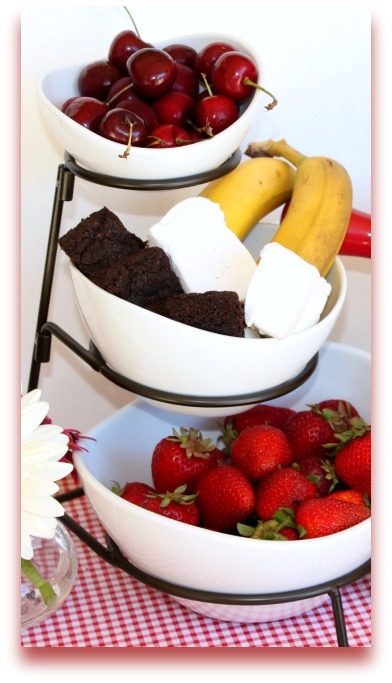 What a wonderful dairy-free chocolate fondue recipe! I need to make this for my French husband tomorrow! Ohhh yummy! I like fresh pineapple and marshmallows in my chocolate fondue- Yumm! Perfect Valentine treat in my book! Fruits and chocolate get me every time. This looks amazing! You’ve made a beautiful display for a party, and especially for Valentines! Oh Sweetheart, I am hungry just looking at your pictures. Bet the boys would love a gluten free graham cracker with a marshmallow dipped in chocolate on top. Sending loves and lots of hugs for Valentine’s Day. What a terrific idea for a Valentine’s Day treat – my kids would go crazy over this! YUM, i am ready for some chocolate fondue. No need for Valentines day, today will do LOL I’d love to have you come over and link up some recipes!